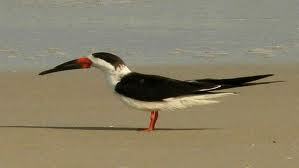 The Indian Skimmer or rynchops albicollis is one of the three species in the skimmer family. It is bright black, white and orange; and its pointed beak cleaves the water as it searches for its prey, mainly fish. It is about 40 centimeters long with a wing span of about 108 centimeters. The skimmer is found only around fresh water, and it may be the only bird that indicates the presence of fresh surface water. But the population of this rare bird is declining due to global warming. The rise in temperature is responsible for the increased melting of glaciers that sends a spurt of water into the Ganges, submerging the islands and sandy pits where the bird lays its eggs. This is posing a threat to the breeding of the bird. This crisis is the result of relentless destruction of environment. The rampant destruction of forests has resulted in many species of animals and birds coming to the verge of extinction. We do not have much time left and this beautiful world and its inhabitants could still be saved if we take corrective measures and implement them with sheer dedication and honesty. Otherwise, we will have only stories to tell to our children, and their children, about how there used to be beautiful animals and birds on this beautiful planet.